McBryde Oil Company offers quality fuel storage tanks, pumps and accessories to meet our customers’ business needs throughout Central Texas. We sell overhead and skid tanks to satisfy every storage need and budget. We have tanks at over 250 ranches and businesses spread out across 7 counties surrounding Kerrville, Texas. 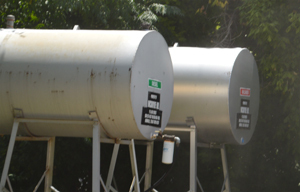 Our tank offerings are available in a variety of styles and capacities to meet your specific facility requirements, from 280 gallons up to 1000 gallons, and can be delivered straight to your site by an experienced, dependable driver. Whether you need tanks for your construction site or special event, McBryde Oil Company carries all the components necessary to set up a fueling system at your location. Let us show you how we can add value to your Texas Hill Country diesel and gasoline storage container needs by contacting us today at (830) 257-6577! Pump prices are for purchases at our 220 McFarland location. Delivered prices are an estimate. Call (830) 257-6577 for your price. Copyright McBryde Oil Company © 2019. All Rights Reserved. Office open Monday - Friday 7:00 am to 5:00 pm. Pumps open all the time.